When people think of the JRPGs on the PS1, most are likely to think of the trio of Final Fantasies that ushered in a golden age of the genre. 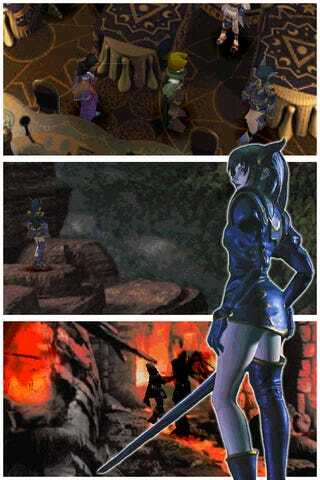 The Legend of Dragoon was often compared to these games, but it was made by the studio that would have a hand in Ico, Shadow of the Colossus, Demon’s Souls and Bloodborne. It was far from a clone or cash grab, even if there is a chance that’s how its development began. The similarities are clear: The Legend of Dragoon is a story heavy game, with hours of dialogue interspersed with turn-based random battles and boss fights. You have a huge world to traverse, though the world map is replaced with a dotted line that takes you between dungeons and towns, and exploration is delivered through level design rather than the world at large. Combat is split into the usual commands: Attack, Guard, Flee/Run, Items and the replacement for Limit Break which is the titular Dragoon. However, the developers (SCE) twisted this formula into something truly unique. “Attack” is enhanced with the ‘addition’ system which is a series of QTEs your character can unlock to turn each attack into an epic barrage of blows. The first of these were easy to master, but as they went on they got to the point where their strange syncopated rhythms were impossible to me. “Guard” blocks damage and heals you for 10% of your HP, making it far more useful than blocking in most JRPGs. Magic is performed with items, most of which are powered up by mashing X, and characters’ stats determine who will get the best damage from these limited resources. Each character also has an elemental affiliation to take into account as you fight. Once you’ve attacked enough, a bar will fill and you can transform into a Dragoon. A sequence then plays that seems part Power Rangers and part Sailor Moon, but with added dragonfly wings and armour. This unlocks more powerful attacks and magic that uses MP. It’s pretty badass. Checking out contemporary reviews, the critics enjoyed the game for what it was, but found it unoriginal and the changes in the formula to be for the worse. They go pretty hard on the story, which does contain twists and turns that feel like RPG tropes... and one very famous one from a particular Sci-Fi movie. While these made me groan, LoD succeeds in other areas. The story is connected deeply to its world building and given that this is drip fed to you throughout the game in small doses, means you have to really focus in and learn about this world to understand what is going on. The character you thought was a throw-away in some lore-filled cutscene always turns out to be vital to the plot ten hours later. This gives the plot depth and history that just isn’t present in the same way in other RPGs and rewards those that wish to learn about the world. Those cutscenes, by the way, are pre-rendered and absolutely mind-blowing for the time. It’s clear that’s where the budget went and likely due their heavy presence in Final Fantasy VII/VIII. The characters are also criticized as being tropes that can be reduced to the colour of their armour, something I disagree with heavily. Each character does begin that way (the spiky haired stoic hero, the valiant knight, the mysterious dark woman...) but most of them develop along the course of the game. It also helps tremendously that each character has a history that’s linked to the plot. This means that they don’t feel like they were made just to fill some kind of niche or pad the party, like certain FF characters do (I’m looking at you Amarant Coral). Did I mention this game has some amazing music? SCE were also willing to go with an oppressive atmosphere that feels darkly unique and really sets the game apart. This lets up in friendly cities and other locations, but when the plot is at its thickest, it can feel grim. This pairs well with the fact that it is more difficult than I would have expected, so hard in fact that they thought it appropriate to have you overcome a 90 minute final boss. And the Japanese version is harder! I bring this game up now, over 18 years after its release, because many look upon this as more than Final Fantasy with a twist. I found this game on a demo disc that came with the Official PlayStation Magazine here in the UK and begged my dad to get me the full game – long before I would pick up Final Fantasy IX and become a raging FF fan. Unlike FFIX, I never finished LoD, likely because I was eight years old, but returned to it, streaming it at the request of a viewer on Twitch. I expected some quiet streams with a few viewers who didn’t mind this crusty old PS1 game with slow, turn-based game play. In my mind, nobody else was going to join specifically for it. I played it anyway as that’s what I wanted to play and it came with a big shock. People kept turning up. People who would give me advice and extol their love of the game. This might not seem so strange, but if you check the LoD directory on Twitch, you often find nothing. Sometimes you find one streamer, which gives you a much smaller chance of finding a streamer you like compared with a game that is more popular. These are people who follow the directory itself, waiting for a streamer to pop up, and there were many of them. One of them was DrewUniverse. DrewUniverse informed me that they were a leader of sorts of the LoD community, having made the Discord server and modding the subreddit and some social media pages. They showed me a dropbox that was a treasure trove of concept art and other goodies from the game development process. I jumped in the discord, expecting a quiet community of uberfans and a few messages a week, but it was far more active than I could have imagined. These people were making fan art, music remixes and even a difficulty modifier that can be used with the ROM. It was then that I realised that while this was no Final Fantasy, Tales of or Persona community that we see all the time, this was an active community pushed into the small spaces they carved out for themselves. I was fascinated and when I got the idea for this article, I asked DrewUniverse if they wouldn’t mind me asking some questions of them and the community. They were more than happy to and even drew up a google form for me and sent it out once I was done (Thanks!). The responses I received revealed a community fuelled by shared love of the unique facets of this game, along with a hefty dose of nostalgia. Nearly everyone who replied had played this in the era it was released, with it often serving as introduction to the world of JRPGs. The things they loved were the things that set this game apart, things that critics at the time disliked! The addition system in particular saw so much love, while the history-spanning story garnered the second most attention. It was these things in particular, along with the odd idiosyncrasies of this game, that caused these people to boot it up again and again, then head to GameFAQs and reddit and discord, to find like-minded people, and to keep doing that for 18 years – despite Sony refusing to do anything with the IP after a sequel was cancelled. And this is what they cry out for the most – they want to see something, anything, from Sony. A remake, a remaster, a sequel or prequel, any of these would do! They’ve signed petitions including one that gained over 4000 signatures. However, DrewUniverse’s goal appears to be more than this and it’s clear from the community answers why that is. Those who knew of the Discord server spoke of a vibrant community that seems to be slowly growing and making things to honour and revitalise the game that they love. Most of those who came from elsewhere, speak of a community that hasn’t changed for years. They don’t talk about a potential convention, or the minecraft server, the translations to the Japanese guidebook or the LoD Radio. This stark divide was intriguing to me and it’s something DrewUniverse would like to bring an end to. As people gather, their opinions and ideas can be collected and put to use. The more that participate, the bigger and more ambitious these ideas can be. Of course, even if every person who desires to see this game return were to rally together, it still might not reach Sony or spark their interest, but currently there is hope. From old platformers like Crash & Spyro, to the survival horror of Resident Evil 2, games from Legend of Dragoon’s heyday are making a comeback. Of course, these are games that went on to make successful franchises and we don’t know if Sony would look upon Legend of Dragoon and see money waiting to be made. Whether it happens or not, the dedication this community has shown already feels against the odds and it’s great to see this cult relic help forge bonds between people 18 years after release. JEMcG can be found over on Twitter and Twitch.